Goal – Identify new anatomical and biochemical markers of resistance in grapevine wood. Activities – Characterize changes in the wood that correspond to resistance to Eutypa dieback, using cultivars with known resistance/tolerance: Merlot (resistant), Cabernet Sauvignon (intermediate), and Thompson seedless (susceptible). Results & Outputs – Identified differences in cell wall and xylem characteristics. 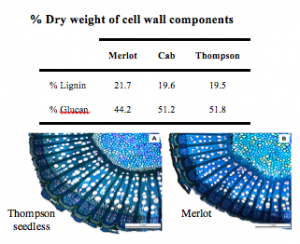 Susceptible tablegrape Thompson seedless had low lignin and high glucan in its cell walls, whereas resistant winegrape Merlot had high lignin and low glucan (Cabernet Sauvignon was intermediate). Xylem vessel diameter also differed between these two cultivars; Thompson seedless had the largest vessels and Merlot had the smallest. Significant Outcomes & Impacts – These markers of Eutypa resistance will compliment the detached-cane screening method, to provide additional measures of resistance. This is important because we are evaluating genetically-diverse germplasm, which may exhibit different modes of resistance. These markers are now being evaluated for the other trunk diseases (Botryosphaeria dieback, Esca, Phomopsis dieback), along with the detached-cane method of screening.